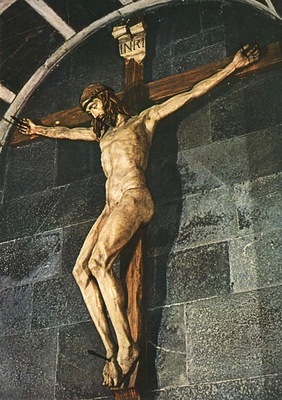 One of the earliest annual celebrations of the Church, Holy Cross Day traditionally commemorated the discovery of the original cross of Jesus on September 14, 320, in Jerusalem. The cross was found by Helena, mother of Roman Emperor Constantine the Great. In conjunction with the dedication of a basilica at the site of Jesus’ crucifixion and resurrection, the festival day was made official by order of Constantine in AD 355. A devout Christian, Helena helped locate and authenticate many sites related to the life, ministry, death, and resurrection of Jesus throughout biblical lands. Holy Cross Day has remained popular in both Eastern and Western Christianity. Many Lutheran parishes have chosen to use “Holy Cross” as the name of their congregation. The cross is the sign of God’s goodness and favor toward you. It is the symbol of salvation worked out for you. It is the symbol of your freedom from all sin, hell, death, and every evil. It was to the cross that the Lamb of God was led without complaint and where He was slaughtered. When Christians make the sign of the holy cross, it is in remembrance of its wonderful purpose and do not think of its shame. When a Christian makes the sign of the cross, he lets the waters of his Baptism quench all the anger, the bitterness, and all the other passions which plague the sinful flesh. The sign of the cross belongs to the Christian, it is a gift given to each of us by Jesus at our Baptism. “Receive the sign of the cross to mark you as one redeemed by Christ the crucified.” The sign of the cross marks you as one who has been bought with a price. The sign of the cross marks you as one truly free from the devil. The sign of the cross reminds you of the price paid to redeem you, the very life of the true Son of God. My dear friends in Christ, please do not hear me making a new demand that you *must* make the sign of the cross in your devotions and worship. While we certainly have the freedom of Christians to do so, it is the heart marked by the sign of Jesus cross which is more important than anything you do with your fingers. In your heart, with much faith, recall the sacrifice of Christ and cling to Him. Engrave His cross upon your mind and embrace the salvation of your soul. For the cross held up the Christ for the salvation of the world. Behold your Lord ˜ the one who drives away all error and unveils the Truth, He who has brought Heaven to earth, He who has made dead sinners into lively children. Because of Christ, the demons are no longer terrifying or frightful; rather they are objects of contempt. Death now holds no fear, it is merely a sleep. All that wars against us has been cast to the ground and trod upon. Let us with a clear voice shout aloud to the world that the cross is our glory. It is the sum and symbol of all our blessings, our confidence, and our crown. Remember as you bear your cross, that in Christ it is a joyful thing. He has redeemed you and calls you His own. Just as it is a privilege, may be difficult, to be called Christian. You do not choose your cross. Your Lord will give it to you. Know that as you bear your cross, that it will at times seem very heavy. It will be tempting to look at how other people fare and to murmur about how light and easy their cross seems to be. It is hard enough to bear one’s own burden without wondering why the other guy bears something different and seems to have it easier. No, do not fix your eyes on what others have or don’t have. Rather, fix your eyes on Jesus. He is your strength and your tower. As you bear your cross as one of Christ’s Christians, know that He stands in our midst with His gifts of refreshment and solace. Do your sins dirty you and cause you to feel filthy? Remember the holy waters of Baptism in which you were washed clean of all filth and evil. Come and confess and receive the words that Christ has given His Church to speak. Are you weak? Does your strength fail? Christ places food into your hand and mouth. He strengthens you with heavenly Bread and drink. He gives His true body and blood in this bread and wine to strengthen you in body and soul. In all your trials, He stands beside you with His Word ˜ that life-giving, refreshing, water of Life to comfort you, aid you, and fill you with hope for this life and the life to come. This entry was posted in Christian Church Year and tagged Baptism, Church Year, Ember Days, Holy Cross, sign of the cross. Bookmark the permalink.